Malik is mostly responsible for his little sister, Tiana, because their mother works during the day and their father works through the night. He doesn't mind most of the time, but sometimes a guy likes his own space. One day while playing near the haunted house just two doors from their home, Tiana disappears. He starts looking for her and calling her name and finds her in the backyard of the creepy old house. She has dug up the edge of a box inscribed with strange text. 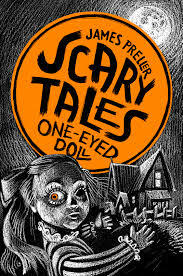 Like a good big brother, he opens the box for her, and within the box is an ugly one-eyed doll. It creeps out their friend, Soda Pop, but Tiana is instantly in love with it and calls it Selena. Things with Malik's sister begin to get weird, then weirder, until he knows that he must solve the mystery of the doll and save his little sister.